Introducing VELVET2, the most robust and advanced LED panel producing velvety soft light. With it’s 100% aluminium body, the VELVET2 is certified to the IP54 rainproof standard and made to endure the tougher shooting conditions on any location or studio. THELIGHT proprietary technology provides CRI 95 and no green deviation light calibrated for HD, film and photo professional cameras to achieve perfect skin tones, vivid colors and real images. The master-slave function is made to control a group of VELVET panels from the one assigned as master. The slender and solid design with its modular system allow quick set up with a wide range of rigging options: ball head rapid mounts, yokes for ceiling grids installations or rigging on location, ¼-20” threads for rigging, multipanel yokes of various sizes to mount several panels together and get big LED sources without investing on bulky fixtures. With VELVET LIGHT there is no need to use correction gels, replace diffusers or tubes due to the digital variation of colour temperature and light intensity. Its incredibly soft beam is very easy to use, produce no shadows on the actor’s faces and does not disturb their eyes. The velvety quality light wraps around the objects and actors getting beauty and natural look images. 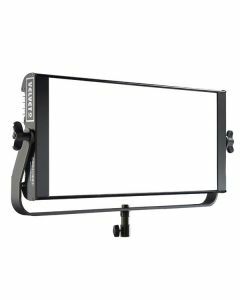 THELIGHT VELVET panels are compatible with any kind of light source and their built-in and DMX digital controls lets you adapt on the fly to the changing light conditions or desired light effect. Forget about gels, diffusers or lamps replacement, save time on adjustments and money on servicing labour. THELIGHT fixtures clearly drop operation cost with no maintenance, instant ignition and adjustment, CRI 95 flicker-free light, heat and noise free operation with no fans to service. Accessories: AC power supply, Vlock or Gold adapter, foldable Snapgrid, DMX 512 splitter, cable in&out, removable barn doors, cordura case, hard case. Rigging Options: Aluminum yoke with 16 female combined with 28 pin, multiple ¼-20” threads for rigging, quick link swivel ball head, multipanels yokes.